I’ve given glimpses of issues I’ve had with parenting style over the years, but I’ve never fully delved into what our parenting style looks like because, well, there’s just so much out there on parenting right now and the last thing I want to do is to add to the competition, the “Mommy Wars,” and the drama. But there is something important going on with parenting: a fight about how much freedom to give our children, how much supervision, how much assistance, and how much structure. And I have strong opinions on this, so I will share them here. But please know that this is my own opinion, my own style, and I try very hard not to judge others based on such personal choices as parenting style. Ours is one way of parenting, and I respect that there are many wonderful successful ways that are very different from ours! As my boys grow older, their physicality and their abilities grow as well. And the way we have raised them, from day one, has been very open and trusting with that physicality. I was not the mom to run over to my baby immediately when he fell down; instead, I waited for his response and more often than not, after a mutual smile back and forth to encourage and reassure, he would rise again and go about playing. I was not the mom to hover over a two-year-old Milo as he learned to climb on play structures at the playground in Washington, DC (yes, he fell hard once, and got some scratches on his face; he also learned to be very careful on that structure and was okay after a good long hug from his mama). 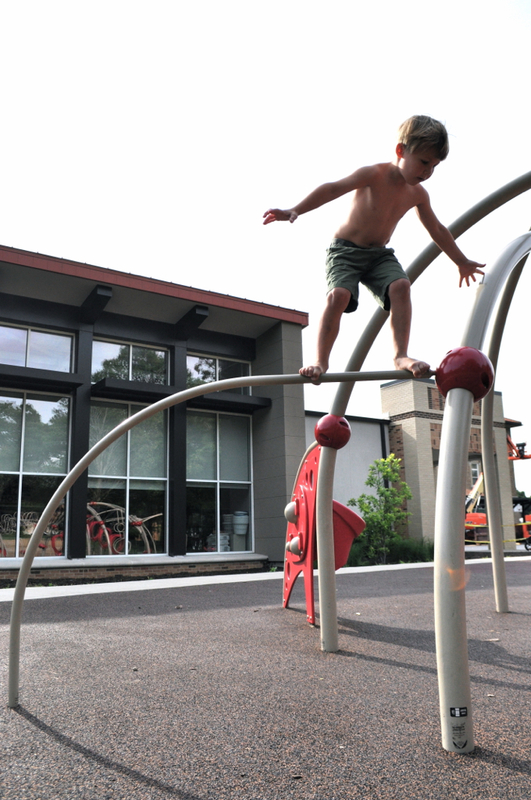 Our three boys can elicit a lot of attention at the local playgrounds; they arrive and immediately take off their shoes (and sometimes their shirts if it’s hot), and run off to climb every which way on the equipment. This includes climbing up slides instead of only sliding down them (oh, the scandal! 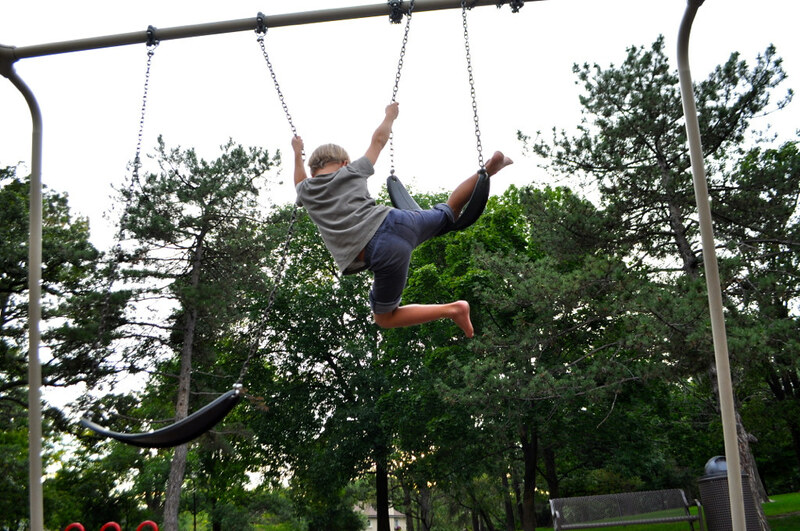 ), climbing on the outside of equipment, and shimmying their way up to the top of the swing set when others are not swinging. 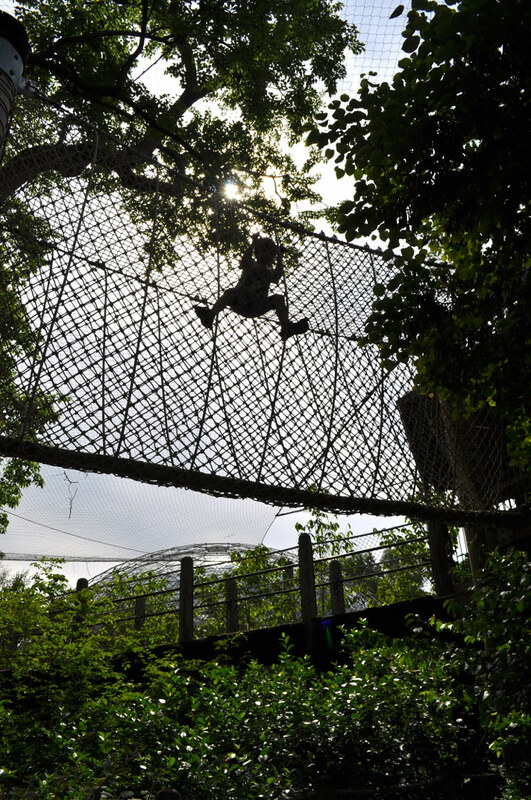 It includes hanging upside down like bats from the monkey bars and standing up on big saucer swings, learning to balance their weight by swaying hard back and forth until they are nearly flying. It includes swinging all the swings in different directions and then running an obstacle course between them, dodging the swings as they run by each one to avoid being hit by them. They play hard, and they can handle it. And those are two very controversial things around St. Louis playgrounds, apparently! I take all three boys to a playground nice and early, and we are the first to arrive. It’s shoes and shirts off right away and then they run off to climb and pretend and play. After about 20 minutes, a father and his 5-year-old son arrive by bike at the playground. I greet them and go back to watching the boys and occasionally climbing and spinning and chasing them. But I start to feel a tension that is palpable with the father. He is watching my boys nervously, and commenting on their lack of shoes to his little boy, perhaps foreseeing that his little boy will want to take his shoes off as well (it’s one of those soft-surface grounds that nearly all playground floors consist of these days). “Oh my! Those boys’ feet are very dirty! They aren’t wearing their shoes, are they?” he comments to his little boy (who is, by the way, playing with his bike helmet on). Sure enough, the boy tries to take his shoes off and his father reminds him that they wear their shoes outdoors because that is the rule. But then, the little boy asks, “But why?” And I kid you not, the dad tells him “Because it’s what you’re supposed to do.” Hm. Is it? And then, Milo is swinging on a giant saucer swing, standing up, shifting his weight back and forth and going higher and higher, the wind whipping his hair, a giant proud smile on his face. The little boy in the helmet is playing elsewhere, but the dad comments to no one in particular, “That is really dangerous. That is just not how that equipment is supposed to be used.” I smile at him to let him know that I hear him and I’m aware of what my child is doing, and that I approve. It’s almost comical at this point, but I try to brush off the feeling that my hackles are beginning to raise. I don’t want to engage, because clearly we have very different parenting styles, and that is alright. I am responsible for my kids’ safety, and if they are not putting his son in danger or disrespecting him, I am comfortable with the way they are playing. I do not owe him an explanation, but realize I would be happy to engage in an intelligent conversation about my parenting choices if he would like to talk about it. The comments go on and eventually I, very warmly and very openly, fill him in on the shoeless thing. I say, “Yes, we let our boys go barefoot a lot because it’s very good for their neurological development (citing this article and a brief overview of these reasons). 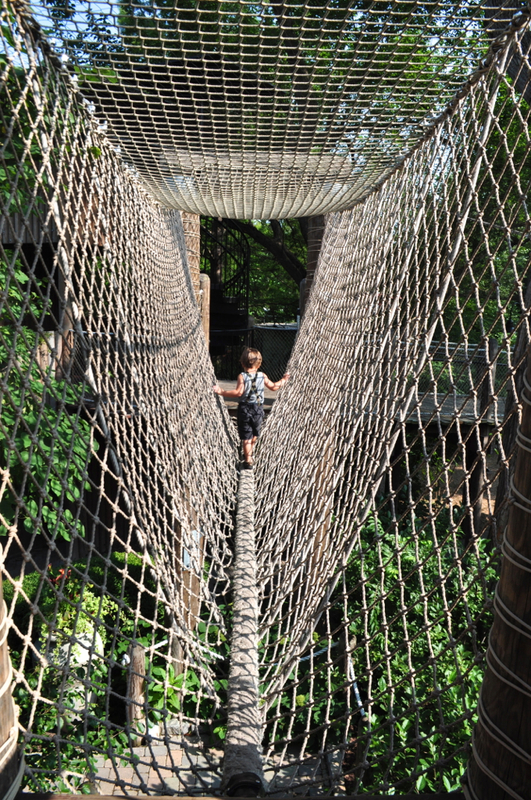 “As long as there is no broken glass around, I’m happy to let them explore without shoes.” End of discussion. While I don’t mind being questioned or judged from time to time about the way I parent (and in fact have come to expect it), what I don’t care for is the assumption that I am a lazy parent because I give my kids extra independence at the playground. The fact is, I read a lot and have thought a lot about what I believe is the best way to raise my boys. The fact is, I am watching, engaged, and aware. The fact is, I completely disagree with some of the parenting choices other moms and dads may be making (for instance, never letting their toddler try to climb up something and instead always lifting them up to the top), but I would never give them dirty looks or make disrespectful comments to them or others within earshot about those choices. 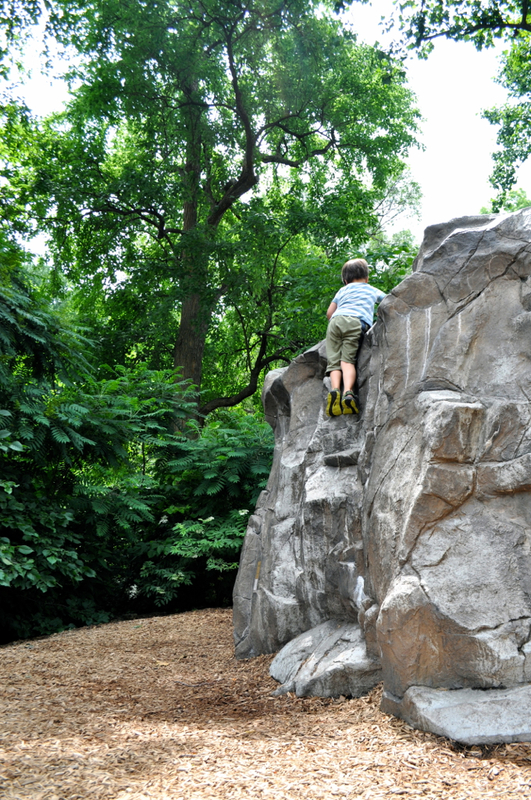 I would not make disparaging remarks to my children about it either; “Oh my, that little boy is not even allowed to climb up the 5-foot plastic rock wall by himself… poor kid! And his dad won’t let him take his shoes off!” I mean, can you even imagine?!! Let’s start assuming that parents have thought about it. That they want the best for their children. That maybe they have researched things and have reasons for parenting the way they parent. One of the most enlightening conversations I had recently was with a very protective mother. We were just chatting and not judging each other, and come to find out, her husband is a transplant doctor who comes home every day with sad stories about accidents involving little children: drownings and car accidents and just horrible things. A lightbulb clicked. Oh! I thought, of course she is protective. Of course! Let’s meet each other with understanding, let’s assume the best. We’ll all be better for it. I have to say, I really admire your parenting! You’re so thoughtful about the decisions you make, something I strive to be as well. I love how adventurous and confident your boys are. They seem like wonderful little guys! One factor that I think merits mentioning is the personality of the child. Your boys seem to be adventurous and independent by nature, and you let them develop how they would naturally, which is exactly how it should be IMHO and super awesome. I love seeing what they’re up to on this blog! One thing I’ve had to struggle with as a parent (and believe I have resolved finally) is that my child doesn’t have certain personality aspects I was expecting him to have. He is very cautious by nature. He is easily frustrated when trying new things and somewhat anxious about new situations, especially when other children are involved. I’ve had to walk a very fine line between being there for him as a support system, providing him with adequate scaffolding so that he can make small achievements to build his confidence, and pushing his limits and encouraging him to try new things. He was never one to tell me “No, I want to do it by myself!,” and I’ve found that if I push him too hard in that direction, he is VERY stubborn in response, then I get frustrated and he gets frustrated and it’s just not a good way to relate to each other. He always wants someone to do it *with* him. He always *wants* my help. It’s challenging because I want him to know he can count on me, but I also want him to develop a sense of accomplishment and confidence. I know sometimes I look helicopter-y to other parents (but fortunately have never had a negative encounter as you described! ), but I stay close because my child wants me to, not because I don’t trust him. Believe me, I would love to be less helicopter-y. I would love if he were adventurous and bold and independent. But that’s not my child, and honestly it took me four years to fully accept that! And fortunately, all of the research supports the idea that providing your child the dependence they need when they are young is what fosters their independence as adults. The level of dependence and the type of dependence just varies by the child and their personality. And good parenting means adapting what you do to the unique needs of your child(ren), which is exactly what you do so well. Such a good point, Liz! It just goes to show that we need to trust other parents and assume they know their child best. I think you’re doing an amazing job with R. It’s so clear that he is sensitive and thoughtful and smart. You are providing exactly what he needs! Very interesting couple of posts here Lauren! My style of parenting is similar to your’s in some ways. I definitely give W a lot of physical freedom to explore his environment, he uses knives (which makes Janes nervous!). I often have friends express confusion over why I’m so over protective of my kids in some respects (namely never having babysitters, quality of food, types of toys)… and then I sit back and let them scramble along slippery rocks or other potentially dangerous activities. As you say, we’ve all thought through our own choices, whether or not they make sense to anyone else. You are obviously an amazing mother, and it’s so inspiring and fun to see your boys grow. It’s wonderful how they can learn from one another, and that all the hard work and patience up front trickles down to the younger brothers. Just awesome! Thanks for being so open about your thoughts, and just blow off jerks in the park who can’t mind their own business. We all come across situations where we have to say ‘no’ to our kids next to another parent who’s said ‘yes’ to the same thing, and there is a respectful way to do it without casting judgement. Second, I’m even more impressed that you allow others’ judgements to roll off of you easily. I struggle with that still! Need to learn to be more confident in my parenting and think only of my kids and not others opinions. So I totally enjoyed this post! Miss you! Lilly, the pieces about children being left alone are so sensitive. I don’t know quite how I feel about it yet. While it is definitely a different world we are living in since when we were kids, I also think that the media over-covers and over-exposes cases involving children and accidents/stranger abductions, etc. Where 25 years ago we may have read about it in the papers or seen it on the news, now we are exposed to the same cases through television and papers and all the social media, and it goes over and over and on and on. It’s enough to make us think that it’s happening MORE often than it is, and I’m not completely sure I agree with it all. I completely agree with you about feeling more comfortable leaving my kid unsupervised in the woods for a while as opposed to a playground. I guess strange people seem more dangerous to me than anything they could encounter in the woods (save for… bears, maybe?). But our kids are still really young, and I’d like to think that in a few years, I would say OF COURSE you can jaunt down to the playground on your bike by yourself for an hour (and even more so if he was accompanied by some of his peers). Unfortunately, that would still be illegal, even when my fiercely independent kid is 10 years old. It’s kind of crazy! Kasey, thank you! I miss you too, friend! 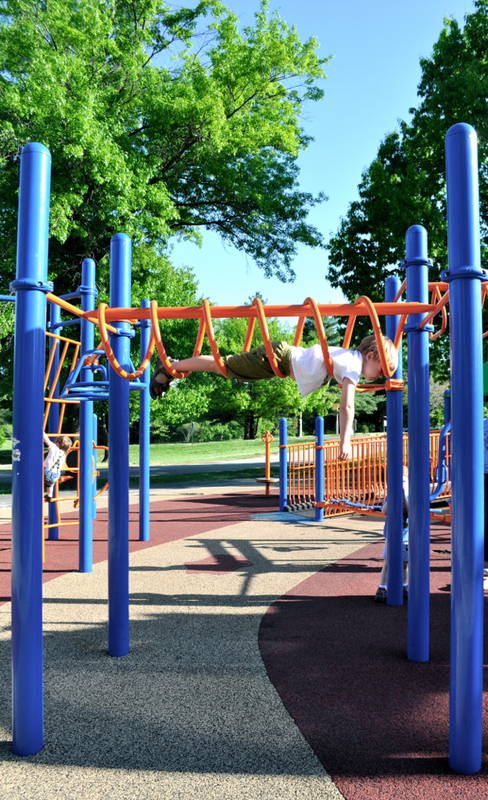 And yes, we have heard of America Ninja Warrior — I think if we showed it to Milo he would bring a whole different game to the playground, ha, ha! And as for letting others’ judgment roll off my back easily, I don’t! It is really hard to feel that way, honestly, like someone disapproves of your parenting or something you’ve done or said. It’s hard to feel judged or disapproved of. I think I have just let myself feel that kind of rotten feeling, then just let it pass as quickly as it comes. In that sense, I can try to be more in tune with what happened. When put into perspective, it’s easier: has this person taken the time to have a conversation with me, or is he just making assumptions? If it’s the latter, then sorry, but it’s not worth the hurt feelings. Loved this post, your approach, and the story…which is borderline hilarious. Not to you at the time, of course, but that dude….WHOA! Wow, his words and behavior were straight up embarrassing. “Not what you’re supposed to do?” …way to think for yourself buddy. And like you, I could totally let that sheep-like adherence to an implied set of rules go if he weren’t commenting upon and judging your boys the whole time. Give me a break! As a mother of a VERY rambunctious, effusive and yes, let’s admit it…wild two year old, i have already encountered so many people, even friends and loved ones, making comments about “what a handful” she is and trying to check her energies in various ways. It can be tricky, for example if she wants to rough and tumble and hug and jump with another kid who is shyer or needs a lot of personal space. But she only JUST turned two years old, and things are still changing all the time. She used to be wild and free by the water, river, ocean, lake…now she has decided she’s scared of waves and prefers to play on the shore. I just try to let her do her own thing, and it will be so fun to see her sister learning and growing right along next to her. Whoops, that posted before I was ready…not sure how…but what I was going to say at the end there was that your call to non-assumption at the end is probably the number one lesson I’d like to fully embody. I know so many parents, all doing the job a little differently, and all beautifully and thoughtfully. I am sorry that you met up with someone that didn’t quite have such an open minded approach, but I think you handled the situation gracefully. And thank you for the links to the articles about barefeet! I had no idea, but intuitively have adopted that method since I can remember. I love to be barefoot, would be EVERYWHERE if it were okay, and none of us wear shoes around the house, yard, park, friends’ houses, etc. So glad to know it promotes development as well! Yay feet! I agree that it is so important not to jump to judgement on parenting styles and choices. I have a ten year old who enjoys riding his bike to the park on our street with his buddies (without me) and runs the block barefoot with homemade bow and arrows (blunt sticks). He received his first pocket knife when he was nine and enjoys whittling. He mows regularly, uses tools, and can fry an egg–all by himself. I know some parents would be aghast at all the potential for harm, but as you said, he can handle it! He knows the boundaries, there have been in-depth discussions on safety, responsibility, and I know his capabilities. I let conscious decisions to allow freedoms I believe important to his character and development over ride fears that are grossly magnified in our culture. It is a sad day when parents face jail time for this. I say our communities and kids need to “reclaim” our neighborhoods. You are obviously a very thoughtful momma, raising boys that are going to be very confident, capable adults! Magnificent work woman! Trina, I’m off to check out your link. It sounds like you are giving your boy a genuine childhood and I’m willing to bet his character won’t suffer for it! It is really nice to read about the way other mamas parent, especially nice when it sounds like you too have been conscious and thoughtful about the way you mother. Thank you so much for your kind words, I am so glad you commented! As a non-parent, I think you are spot on about not judging others in any situation (with or without kids). So well said, Lauren. I am a big believe in “to each his own” and applaud you and Andrew for raising such smart, strong, very self sufficient cuties. Having been around a lot of kids and especially so close to my nephews, each child’s personality plays such a key role and ultimately the parent knows best. Great dialogue you’ve created here, Lauren!! And BIG props to Milo — loved that video. I just kept thinking he is STRONG 😉 Hi to Andrew! I couldn’t agree more with your post! Its refreshing to read someone express their strong opinions while supporting those who may feel differently. If we met on the playground with our children I may be one of those moms that lift my toddler up to reach play equipment and redirect my preschooler to be more cautious. What others don’t know is that both my kids have special needs and if I didn’t lift the toddler he would never get to enjoy the playground as fully due to his physical differences (that are not readily apparent to an onlooker) and if I didn’t remind my preschooler to be cautious he truly would injure himself as he doesn’t have the same impulse control or balance that other kids have. Give other parents the benefit of the doubt that they may know their kids better than you do and trust them to keep their own children safe in what ever way works best for them. Joy, thank you! Thank you for reminding us that we don’t always know or understand, and we should be humble and non-judgmental with other parents. So important to remember that we don’t always have the whole story! just echoing what the others have already voiced – this was really great to read. i think your blog attracts a certain crowd, and it’s nice to not only hear the reassuring comments but also to learn from similarly thoughtful parents. even when i like to pat myself on the back for not helicoptering, it is SO hard to be truly at peace with letting him run along his own path (he doesn’t walk, he just sprints. all the time). i’d love to sound all enlightened about how it’s the right thing to do, but i just can’t, if i’m being honest. it takes serious effort every time, and i do cringe when he races his little balance bike down rough terrain. no brakes!!! i think his character trait that worries me most is defiance. i read somewhere that things that tend to be so difficult in toddlers are the behaviors that we like to encourage in teenagers: tenacity, insistence, independence… squeezing my eyes shut and crossing my fingers that his spirited sprinting and biking stays with him. Coming out of lurking for this one. I’ve been reading, and very much enjoying, your blog for a while but haven’t commented yet (shyness?). My daughter has flown the coop so I am no longer the parent of young children, but I remember the judgment of other parents very well (it never really ends, unfortunately). I also used to teach in an independent school that borrowed the best concepts from Waldorf, Montessori, etc. I taught middle school and loved having the freedom to take the kids outside on a hike if they all seemed particularly wound up or unable to focus in the classroom. It’s been proven that boys tend to learn kinesthetically and that physical movement is crucial to their ability to retain information so I heartily support you in allowing your boys to explore the world around them fully and completely (with a watchful eye). I was so young (19 when pregnant, turned 20 five days after giving birth) when I had my daughter that I really never thought about my parenting strategies or skills. As she got older I just always thought “People are adults much longer than they are kids so if I can raise a future adult with whom I enjoy spending time, I will have done my job.” and that was as close to a theory of parenting as I got. Also, there just weren’t as many resources for parents when she was younger (barely an internet and far fewer books). Your boys will benefit in innumerable ways from the time and effort you put into HOW you want to raise them. I applaud you. I really appreciate your comment, especially your philosophy on raising a child to be a future adult — such a great point! And honestly, I think parenting in an age where there are fewer resources was probably a blessing in disguise — too many times I feel the barrage of parenting stories, books, articles, etc. and it can be hard to ignore them and just go with my gut. At the end of it all, I think that’s what we mamas and papas should be doing!